This building in the foreground, the switching station, looks pretty much is it did when built. The first floor of the taller building was altered by the installation of a low, wide display window. Its three chimneys were also shortened. It has great potential for the future. The old passenger depot is at right. Splitting the city in half north and south, the railroad has played a prominent and important role in the growth of Fort Valley. A large brick freight depot was built on the west side of what is now Main Street in 1871 and a passenger terminal was added in 1900. At one point, passenger and freight traffic through Fort Valley was so heavy two large hotels, the Winona at Main Street and the Bassett (also known as the Watson House and the Central Hotel) at Hwy. 96, were builtto house the many visitors to the city. The Winona was torn down in the mid-1960s and the Bassett was destroyed by fire in 2006. This view was probably taken from the Winona Hotel showing the switch station and passenger depot in the 1920s. The handwritten note says "depot and Van Roy Lunch Room," which was likely in the lower floor of the switch building. This appeared on a post card. Fort Valley is fortunate that three of its historical railroad buildings have been spared the wrecking ball. 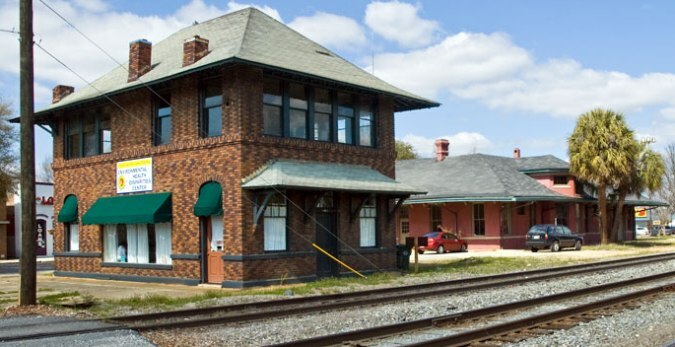 The old passenger station was completely renovated several years ago and the freight terminal and switching station remain basically unchanged from the day they were constructed by the old Central of Georgia Railroad around the turn of the last century. When the Southwestern Railroad, one of Georgia’s oldest railroads, was chartered in 1845, Fort Valley founder James Everett was one of its first supporters. Everett invested the money needed in 1851 to bring the Southwestern Railroad to Fort Valley heading westward to meet the unfinished Muscogee Railroad, a 50-mile line begun in 1847 as a Columbus-to-Macon route. Fort Valley’s official city charter, which was granted on March 3, 1856, set the corporate limits of one mile in each direction from the first railway (freight) depot. Fort Valley’s Freight Depot is an example of the Central of Georgia’s early Postbellum American "Railroad Style" depots built from 1868 to 1876. It is one of only 10 depots of this type still in existence in Georgia. The Freight Depot served as the agricultural gateway for both the cotton and peach industries during the last half of the 19th and first half of the 20th centuries, and was on the route of both the "Dixie Flyer" and the "Flamingo" rail lines which ran from Chicago and Detroit to Key West. During the 1860s more than 30 percent of all of Georgia’s cotton traveled on the rail lines through Fort Valley. In 1884, on his Willow Lake Plantation, located south of Fort Valley near Marshallville, Samuel Henry Rumph developed one of the most popular peach varieties of all time: the Elberta peach, named after his wife. The Elberta peach was unique in that it could withstand rail shipment without significant bruising, and Fort Valley soon became the main shipping point of these peaches. At one point more than 50 packing sheds ran during peach season in Fort Valley and Peach County providing thousands of jobs for young and old alike and creating an almost-insatiable demand for refrigerated railroad cars. The Fort Valley Freight Depot helped support the booming peach industry of the 1920s, exemplified by the construction of the $1 million Atlantic Ice Plant near the center of town in 1925. In its first year, this plant provided ice to cool more than 17,000 rail cars of peaches, which were shipped from Fort Valley to points all across the United States. At the time it was built, it was the largest ice plant in the world. According to local peach grower Bill McGeehee (Big 6 Packing Company), and local historian the late Wallis Hardeman, the 17,200 railroad cars were the equivalent to about 9,000 truckloads of peaches (one railroad car averaged 400 bushels of peaches). In the 1950s and '60s, 400 pound blocks of ice were still used to "hydrocool" (cold water wash) peaches before they were washed, graded, packed and loaded on trucks for shipment. Every local packing house ran trucks to and from the ice plant to constantly replenish the huge hydrocoolers. Modern day refrigerated trucks and railroad cars have eliminated the need for ice houses and hydrocoolers. However, most of the ice plant is still in existence today and is being used for cold storage. At one time the U.S. government used the facility to store ready to eat meals (modern day C-Rations). Currently the ice house serves as a cold storage warehouse for peanuts. The old freight depot is a jewel in the rough and plas call for it to be restored and renovated as an interpretative railroad museum. The City of Fort Valley anticipates that a renovated and converted Freight Depot will lead to additional tourism dollars and economic vitality, as well as to the future restoration of other important historic facilities throughout the community. The planned transportation museum will make the historical linkages between agriculture and transportation more meaningful. Also, the benefits resulting from the successful renovation of the Fort Valley Freight Depot will extend beyond the Fort Valley city limits. Fort Valley and the City of Perry are exploring the opportunity to create excursion trips along the Ogeechee tracks from the Fort Valley Freight Depot into Perry. Unique tourism activities such as this will be a draw for the entire region, as both Fort Valley and Perry would benefit from the project, sharing and cultivating Middle Georgia’s regional agricultural and transportation history.